Jennifer Read Hawthorne is the co-author of The New York Times No.1 bestsellers Chicken Soup for the Woman’s Soul and Chicken Soup for the Mother’s Soul, and also Diamonds, Pearls, and Stones: Jewels of Wisdom for Young Women from Extraordinary Women of the World. She is an inspirational speaker who delivers keynote addresses internationally. Jennifer was inspired by the creative craft of the under resourced women making global quality products. Part of the sales proceeds of the SAGE garments that Jennifer bought from Meenakshi’s Dancing Peacock’s fashion outlet went towards buying raincoats for the children in this picture. 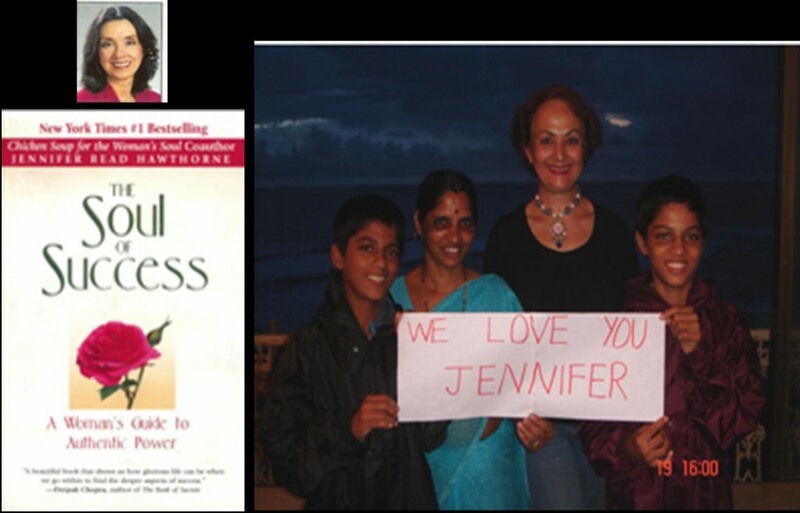 Jennifer bought SAGE products because it helped to educate a child.